The process of finding a female lead to star alongside Chris Evans in Captain America: The Winter Soldier has been difficult and gruelling, Many, many names have been tied to the role, with actresses like Imogen Poots, Anna Kendrick, Felicity Jones, Mary Elizabeth Winstead and a whole lot more all in contention for the coveted part. 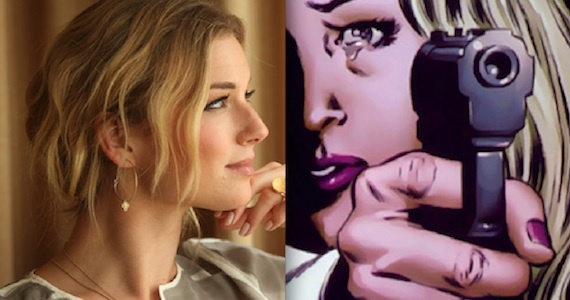 Today though, the studio has settled on their leading lady and it will be none other than Emily VanCamp. Who, you may say? She’s the star of TV’s Revenge and also had parts in films like Carriers and The Ring Two. Still not sure who she is? Don’t worry, we’re not too familiar with her either. That’ll all change though as she’s set to take on the role of Sharon Carter, a former S.H.I.E.L.D agent and on and off girlfriend for Cap. She is also related to Peggy Carter, who was played by Hayley Atwell in the first film. Personally, I didn’t love Captain America: The First Avenger. I actually thought it was one of the weaker Marvel films. That being said, I thought Evans was great in the lead role and as a whole, it was still packed with enough entertainment and spectacle to make it worth a watch. While I enjoy franchises like Iron Man and Thor better, I can still safely say that I’m interested to see how they’ll expand the story and universe with Captain America: The Winter Soldier. Directed by Joe and Anthony Russo, and starring (aside from Evans and VanCamp) Sebastian Stan, Anthony Mackie, Frank Grillo, Cobie Smulders, Toby Jones, Scarlett Johansson and Samuel L. Jackson, Captain America: The Winter Soldier will hit theatres on April 4th, 2014. What do you think of this news? Are you familiar with VanCamp? Are you looking forward to the film? Let us know in the comments below.